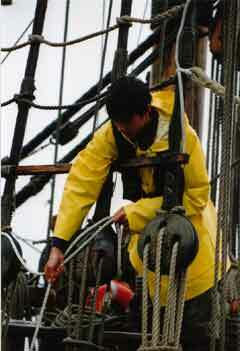 Ruben Ranzo, an inexperienced sailor is shanghaied aboard a whaling ship. The captain's daughter takes pity on him, teaches him navigation and the finer points of sailing, marries him and he becomes the finest sailor on the seas. It has been suggested that Ranzo is a corruption of the name Lorenzo. American whaling ships often recruited Portugese seamen in the Azores, and Ranzo may have been one of these. * The holy stone resembled a vacuum cleaner in shape, but weighed around twenty-five pounds. A round stone was at the end of a handle. Sand was put on the deck and sailors scrubbed to get the gunk out of the wood.